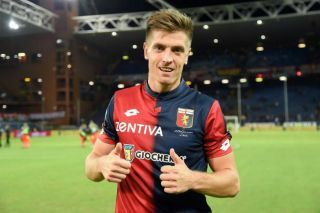 AC Milan are reportedly set to wrap up a deal for Genoa striker Krzysztof Piatek next week, while two more transfer targets are being eyed. The 23-year-old has enjoyed a fine start to life in Italy this season, scoring 19 goals in 21 games despite Genoa’s general struggles in the bottom half of the Serie A table. In turn, his form has attracted interest from Milan, who are set to lose Gonzalo Higuain to Chelsea this month as per The Guardian, and so that void will need to be filled. As per Sky Sport Italia’s late-night transfer broadcast, as reported by MilanNews.it, Milan are said to have agreed on a €35m plus bonuses deal for Piatek, although it’s added that both Alen Halilovic and Andrea Bertolacci could move to Genoa as part of the move. That seems like sensible business from the Italian giants in truth given neither have played any real role under Gennaro Gattuso so far this season, and so they are essentially trimming their squad and cutting the wage bill by offloading players deemed surplus to requirements. However, it is added in the report that Bertolacci’s move remains complicated as no agreement exists yet, while Calciomercato add that another meeting will be held on Tuesday to conclude talks and finalise the details of the transfers. Meanwhile, that might not be the only bit of business that Milan will look to complete this month, as Sky Sport Italia’s Gianluca Di Marzio has added that both Yannick Carrasco and Amadou Diawara remain on their transfer radar. Carrasco in particular would seem like a very sensible addition given the lack of quality depth that the Rossoneri have in the wide positions, with Gattuso relying heavily on Suso and Samu Castillejo, while playing Hakan Calhanoglu in an unnatural role. Time will tell if others arrive in addition to Piatek, as they all could prove to be fundamental as Milan continue to chase a top-four finish this season to secure a return to the Champions League.